Visitors will be encouraged to interact with history and nature at places like Cloughoughter Castle, Co Cavan. 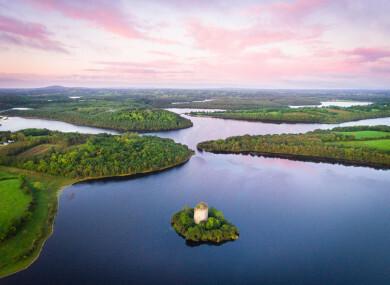 FÁILTE IRELAND HAS unveiled a new tourism campaign for the centre of the country, rebranding the midlands as ‘Ireland’s Hidden Heartlands’ as a way to boost tourism in the area. A focus on the River Shannon, the development of new food networks and trails and a creation of new walking hubs are part of the campaign to attract a larger number of visitors. The plan is to entice visitors with the area’s walkways and lakes, and the campaign will promote activities like walking, cycling, fishing and boating. The area covered extends from Leitrim down to East Clare, including Longford, Roscommon and East Galway, and parts of Westmeath, Cavan, North Tipperary and Offaly. The area will become a tourism development zone, with Fáilte Ireland initially investing €2 million to develop the region and for marketing campaigns. Further investment will follow, the organisation says. The River Shannon will be a central focus of the brand, and Fáilte Ireland is developing a ‘Shannon Masterplan’ to drive tourism areas on and around the river and in surrounding towns. This new brand has been created to work alongside other brands that Fáilte Ireland has created in order to market various parts of the country, such as the Wild Atlantic Way and Ireland’s Ancient East. The area overlaps in parts with Ireland’s Ancient East, with businesses in those areas told to choose what branding suits them best. Fáilte Ireland says that the brand, name and logos were developed after extensive research with consumers across Ireland and other countries including the UK and France. Over 10,000 people were interviewed. An advertising campaign will be aimed at Irish audiences this summer, and will be directed at a international market once the brand develops. The campaign will transform the midlands, Kevin ‘Boxer’ Moran, Minister of State for the Office of Public Work, said. I’ve heard first-hand from people and businesses across the region about the major potential this area has to attract visitors and the willingness there is to grow tourism. Email “The new Wild Atlantic Way? Ireland's midlands have been rebranded as the Hidden Heartlands”. Feedback on “The new Wild Atlantic Way? Ireland's midlands have been rebranded as the Hidden Heartlands”.